Diabetes Global Village is 5 years old. Born on November 14, 2007, the event was my second after leaving my 10 year job at Nation Publishing Co. Limited as it Corporate Communications Manager. Digicel is playing its part in assisting the Diabetes Association of Barbados in its quest to educate Barbadians about diabetes. The mobile telecommunications company has been working closely with the association over the past few months and recently presented the membership with two Jablotron desktop phones to be used as hotlines. Digicel's commercial director, Alex Tasker, explained that the company was pleased to work with the DAB as diabetes is one of the most prevalent illnesses on the island. "We will be assisting the association with its educational programme to ensure that every single Barbadian is aware of diabetes and its related complications. We are extremely passionate about the prevention and management of this disease in Barbados and are aware that through education, we can give this process a boost. "Over the past few weeks members of the association have been joining us on our radio shows and other events to give the public information on the association and diabetes and now, with the two new Jablotron desktop phones, they have another avenue to get this information out, not only to members of the DAB but to the general public as well," Tasker explained. Immediate past president of the DAB, John Grace, thanked Digicel, noting: "We are extremely grateful for all the assistance Digicel has offered us over the past few months. It is great when a company is concerned with the health and well being of the citizens of the country it operates in and we quite pleased that Digicel has a keen interest in Diabetes and the effects it is having on Barbadians. The numbers for the two hot-lines are 836-3737 and 836-2737 and members or the general public can feel free to call for any information or advice. When we look at the number of young people with diabetes in Barbados, something is definitely wrong, says Southern Region chairman of the Diabetes Association of Barbados, Rudolph Smith. 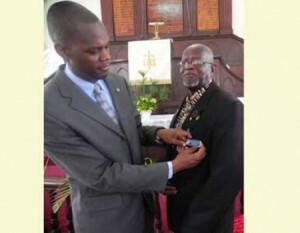 Smith was speaking to the DAILY NATION after an installation service for the 2011 executive officers of his region at the Providence Methodist Church, Christ Church. The chairman, drawing on statistics of “two years ago”, said the increase with which “young people [were] coming down with diabetes” was “of great concern”. Smith lamented that though accurate and relevant information on the disease was easily accessible and available to the public, it seemed as though “we are not getting the message through to our young”. “And I don’t understand why, because there is a lot of information out there in the print and electronic media, and now the Internet. So it is a case that people know what to do, but they are not doing it . . . . They are not doing what is necessary to make sure that they live a better life,” he said. Smith pointed out that the Ministry of Education had implemented a system to have healthy snacks sold at schools, but said he had observed the opposite. Taken from the Daily Nation Newspaper April 18, 2011.